When Ava Flynn walks away from a scholarship to Georgetown and moves into her grandmother's abandoned summer home in coastal Maine, she steps into the center of a centuries-old curse. On her first night, she notices a mysterious leather-clad stranger looking up at her third-story window. For weeks, everywhere she goes, Ava catches more glimpses of him, but she can never get close enough to find out who he is. Over 300 years ago, Lady Catherine Fairchild risked everything to protect her unborn child, sending a ripple through time that would change Ava's future. As the mystery unravels, the horrifying consequences of Lady Catherine's choices drag Ava deeper into a world she never knew existed, trapping her in a conflict that's been raging since before she was born. A winner-take-all battle for her soul. I found the soul mate concept in this book interesting, but, overall, it lost my interest. It is full of a lot of cliche romance novel elements and angst. I had hoped it would focus more on the paranormal and less on the romance. That is just my personal preference, though. Others may like that in a book. This paranormal Romance was quite unique with some time travel thrown in for good measure. It does conclude in a huge Cliffhanger so I’m really looking forward to finding out what happens. The plot of the story is very unique and the story unfolds at a good pace. It picks up a bit towards the end and things conclude leaving you hanging. The main characters were intriguing and interesting. The secondary characters were also great. The story building was well done and going back and forth between past and present worked well for explaining what has caused the main characters to be linked in such an unusual way. I’m looking forward to book 2! Loved the story and the characters, unique paranormal listen. Ends on a bit of a cliffhanger, eagerly waiting on the next in the series. Great narrator too! I received a free review copy of this audiobook at my request and I have voluntarily left this review. 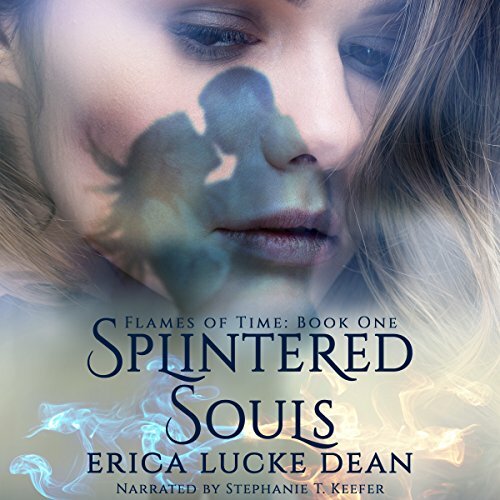 Be warned splintered Souls: flames of Times is the first of two books that must be read together if you want to know what happens at the end. This is not a series, the novel is split into to two books. Which is not surprising that it ends on a cliff hanger. I found the book to be predictable, have many cliches and a love triangle. That is not to say it is bad since there is enough romance and intrigue to keep you reading. The narrator was great at voicing the females but not so the male characters but with practice she might get better. Ava began having strange dreams after moving to Maine with her brother and mom. Her dad had recently died and she wanted to be there to support her mom so she gave up her scholarship and registered at the local community college. Ava is mystified by the cute guy wearing the leather jacket that seems to be everywhere. Quickly things get stranger. She is having intense dreams, learns of time travel and meets her two soul mates who are not just attracted to her, they are obsessed with her but which one is telling the truth? This is my first Erica Dean book and the writing was first class with an interesting concept. I may have enjoyed more if I had read instead of listened to the book. Stephanie Keefer did great with the female voices but the male voices were not appealing. Hopefully, that gets better with more experience. I was given this audio book for my honest review. I received this book free from eblast, the author, and publisher in exchange for my unbiased opion. The narrator is pretty good. The plot is good. The dialog is extremely predictable. I hate when you can predict what the characters are going to say. Too many cliches. the end also leaves you completely hanging. This book was fantastic! I really enjoyed it. It had just enough intrigue, just enough romance, and lots of great supporting characters. The writing flowed nicely and the narrator was great with all of the different voices. I received this book as a gift and am leaving this review because I want to. It's a great book, you won't be sorry! This is the first book of two and ends on a cliff-hanger. The second book is not out on audio yet…but after listening to this book, you’ll be clamoring for the next one. I’ll be honest – paranormal-fantasy, and other books that require that level of creativity to write, always leave me in awe. This book is one of my favourite kinds – a contemporary setting with some nice time travel thrown in. But I digress. When Ava Flynn moves to a small town in Maine to help her mother and brother cope with the untimely death of her father, she has low expectations. Instead of attending Georgetown, a large prestigious university in a big city, she’s stuck in a small town and an insular social group. She’s lucky to meet another freshman and now she is a member of a clique. But it’s the leather-jacket-clad man leaning against the tree across the road the night she moves in who sets her mind spinning and her hormones racing out of control. Is there such a thing as a soul mate? Ava’s mother’s grief demonstrates that love exists and loss is real. How about the mysterious stranger? Maddox is, by necessity, an enigmatic person. He hides his history. It’s easy to see he’s connected to the opening scene in the book – Lady Catherine going out in the middle of the night to meet with a conjurer. As the story unfolds, Maddox’s layers are peeled away like the skin of an onion, each layer leading one closer and closer to tears because as much as Ava believes Maddox is her soul mate, things are never quite that simple. Stephanie T. Keefer is a great choice for narrator. I thoroughly enjoyed the book and can’t wait for the conclusion.